Marysville has awarded $100,000 in Uptown improvement grants. 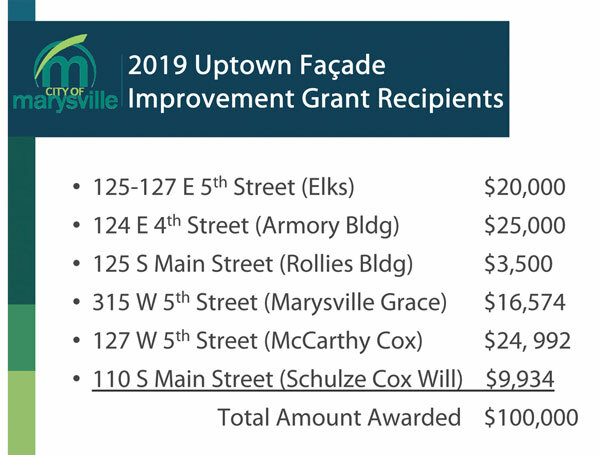 At Monday nights’ city council meeting, officials announced winners of the 2019 Uptown Façade Improvement Grants. Winners include the Elks and Armory buildings, Rollies, Marysville Grace, the McCarthy and Cox building and the Schultze, Cox and Will building. Several years ago, the City of Marysville created the Uptown Facade Improvement Program to stimulate commercial building improvements located in the Uptown. This is the second year grants were awarded. Council has committed to $100,000 for the program for 10 years. City Administrator Terry Emery said the program is meeting that objective. Council member Alan Seymour told administration how much he appreciated the program. Property owners or tenants making exterior improvements to their building in the Uptown can apply for the grants, which can cover as much as 50% of the project’s total cost. Mayor J.R. Rausch explained that grants are “generally” capped at a maximum of $25,000. According to the city, grants up to $50,000 may be considered for “economically significant” projects, those with high investment, positive community impact, innovation, job creation or other criteria. The applicant must use private non-City funds to match the grant. Grantees will be reimbursed at the conclusion of the project, after certification of project costs and verification of compliance with the approved plans. City Planner Chad Flowers explained this year’s projects. He said the Armory building, 124 E. Fourth St., windows will be replaced, front concrete steps will be replaced and repairs will be made to the building foundation. The Elks building, 125-127 E. Fifth St., will get new brick, the façade will be painted, an ADA compliant ramp will be built and the awning will be replaced. At the Rollies, 125 S. Main St., decorative trim and the front façade will be replaced. The Marysville Grace office, 315 W. Fifth St., trim repair and repainting. The Schultze, Cox and Will building, 110 S. Main St., will be painted and get new windows. “We can’t say enough about these investments that these businesses are putting into this,” Hoyt said. The Avalon Theatre project, 121 S. Main St., the Marysville Entrepreneurial Center, 129 N. Main St., and Carriage Works, 222 E. Eighth St., applied for funding but did not receive grants. He said that projects are to be completed before the grant money is dispersed. He said most of the improvements are either completed or will be shortly. Improvement efforts are to be in line with the revitalization of historic Uptown Marysville, as well as the Uptown Revitalization Plan and design guidelines for the historic section of the Uptown. Emery said the grants are funded by “non-tax revenue” specifically mentioning interest from city investments. “We cannot use tax revenue to do the façade improvement program,” Emery explained.